The Geneva Bible was the "Bible of the Protestant Reformation", and the Bible of the Puritans and Pilgrims. It was the first Bible taken to America, brought over on the Mayflower. The Geneva Bible is the Bible upon which America was founded. 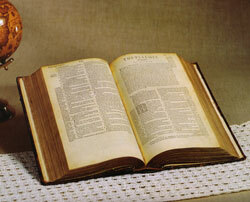 It was the first Bible in English to add numbered verses to each chapter of scripture. Also known as the "Breeches Bible", the Geneva Bible was also the first "Study Bible" with extensive commentary notes on the margins. Printed from 1560 until 1644, the Geneva Bible is the only Bible to ever surpass the 1611 King James Bible in popularity among the people of its day. Read more about the History of the Geneva Bible. View Geneva Bible materials available today.